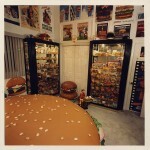 If you spent all day thinking of the unusual items that people collect, we bet you’d never think of hamburgers. Hamburger Harry, a German immigrant living in America (where else? 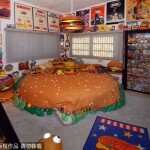 ), has collected more than ten thousand hamburger-related items. 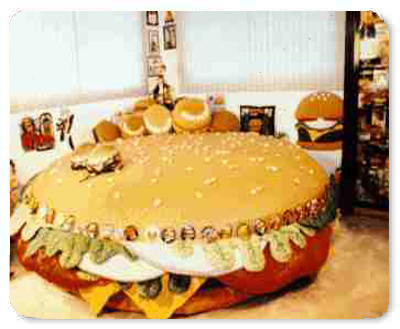 including the Hamburger Bed and a the world famous HamburgerHarley. Hamburger Harry, who rather disappointingly is from Wetterburg instead of Hamburg, developed an interest in burgers seven years ago, when, on a whim he bought some hamburger display items from a toy store. 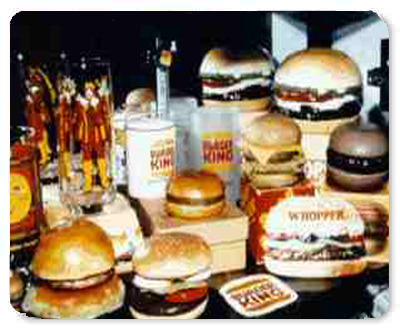 He put some on the desk in his office, and a friend who spotted them asked if he was collecting burgers. How easily a collector is made! Hamburger Harry thought. 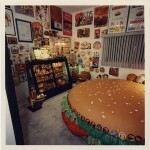 “Why not?” So became what was at the time the world’s only Hamburger Museum, at present on display in a room of his home. 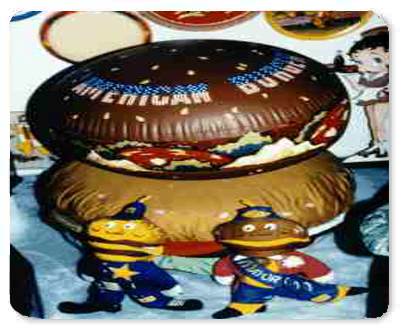 (Now promoted as the “International Hamburger Hall Of Fame”) His official explanation for collecting burgers is that they are an icon of the United States and he loves Americana. The collection includes more than 10,000 different hamburgers and some pretty unusual burger material, including the Nickelodeon Good Burger Mobile. There are banks, biscuit jars, clocks, hats, trays, erasers, badges, magnets, music boxes, a pencil holder, salt and pepper shakers. and much more. 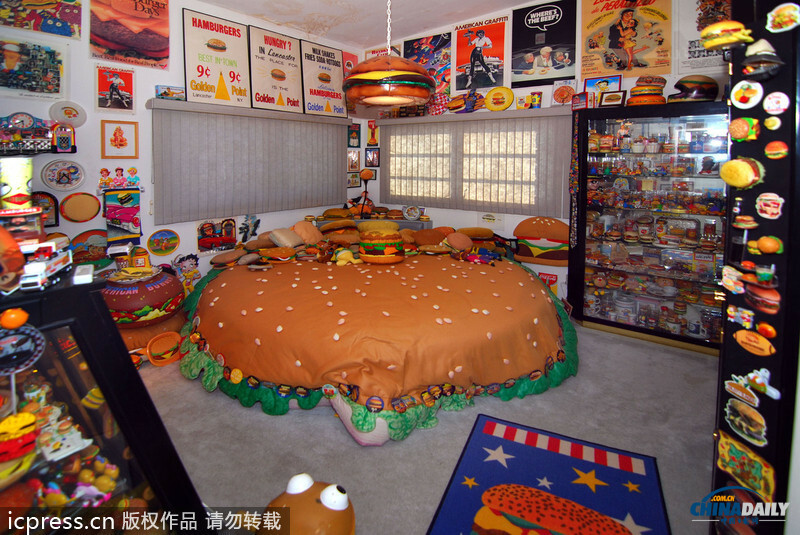 As if that were not enough there is also a set of Hamburger Beds one of which is complete with a sesame seed covered spread and matching pillows. There are signs, posters, glasses, cups, bowls, stuffed toys, T-shirts, towels, calendars and postcards. Most of the material was picked up at flea markets and garage sales, where Hamburger Harry trawled for burgers with friend and fellow enthusiast Ron Baynton. 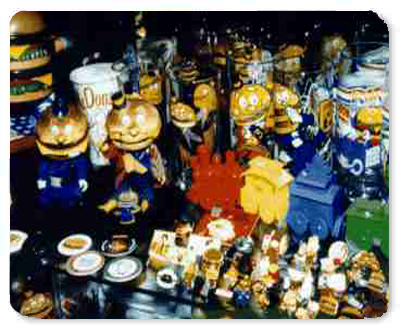 When Baynton decided to give up collecting hamburgers, Hamburger Harry bought his collection and added it to his own. 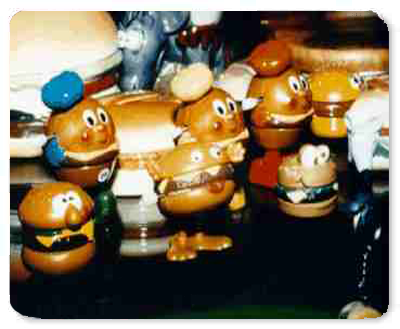 Now, we’ve all had the occasional rubber burger, but those in Hamburger Harry’s collection are intended to be inedible. They are also made from tin, cloth, clay, ceramic, plastic and sterling silver, with his favorite being a simple ceramic replica which cost him $90. 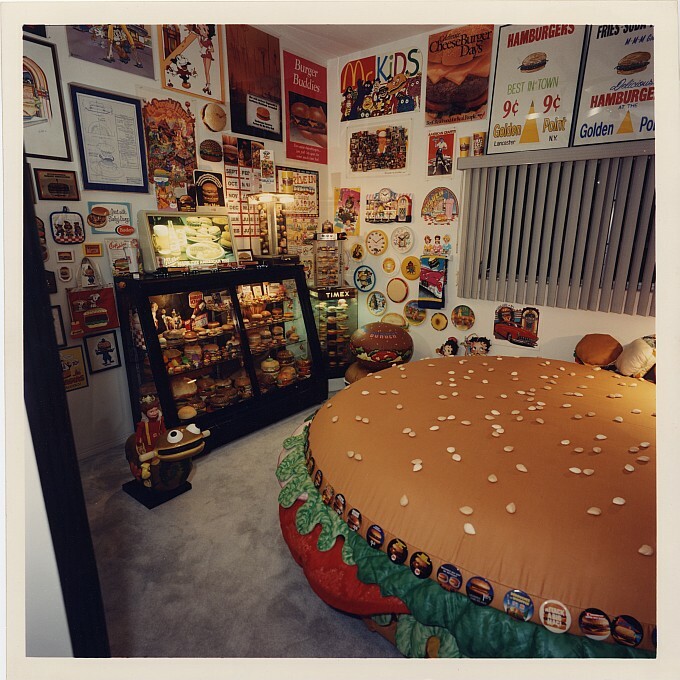 He considers it the Rolls Royce of the collection, although there are other items which were more expensive; the Cheeseburger Water Bed cost $3500, and a Big Boy doll holding a hamburger set him back $350. 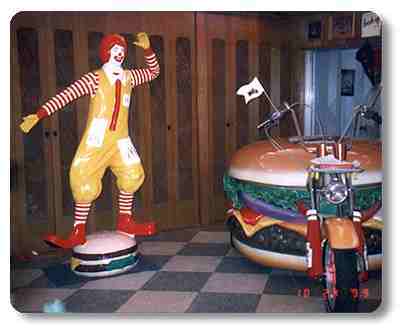 One of the gems is a Custom Harley which came about through Hamburger Harry’s other interest in motorbikes. His company exports souvenir novelty Street Signs & License Plates, and other novelty gifts, or, in his own words, “Items that are of no use to automobiles and motorcycles.” Examples of his enthusiasm for motorcycles are parked in his home – literally. On the wall over the front window there is an old Chrysler grille with headlights which light the room when turned on. On another wall is a door from a 1963 Ford Fairlane, with an accent of purple neon light. A chrome-plated, 350-cubic-inch Chevrolet V8 engine, which acts as an end table, is placed next to the sofa, and in the middle of the room there’s a mannequin of a drive-in waitress. All of which serves to highlight Hamburger Harry’s pride and joy – a Custom Harley. Called a ‘Shovester‘ because it’s a combination of Harley Sportster and ‘Shovelhead’ models, the bike has pride of place, parked in the middle of the room on a mirror in order to highlight the glamour of the gold-plated chain and chromed plated undercarriage of the machine. 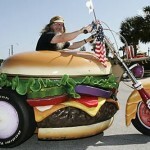 But this bike is not the Hamburger Trike? 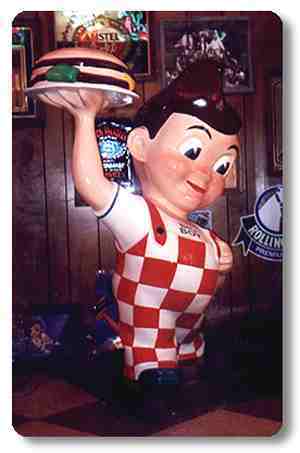 Hamburger Harry had been toying with for years. He originally thought of using a Volkswagen Beetle, but decided he wasn’t keen on the sound of the air cooled flat 4 engines. Next he considered a hamburger dragster or low budget go-cart, but that became the project of the mini hamburger in training Hamburger Karl. In the end his love for the Harley Davidson won out. In January 1994 he bought a 1100cc Harley with the intention of converting it to a trike, and contacted Leonard Berroth to fabricate the large body needed to cover the bike. 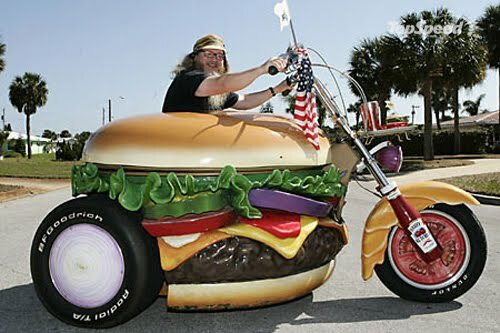 The HamburgerHarley was born.